Hey thrifters! How was your week in thrifting? As you can see from the above photo, mine was pretty good! All your Pyrex well wishes & good Pyrex vibes paid off! They are all pieces that I have yet to add to my collection, too. I brought a lot home this week. I can't remember the last time this much has come home from the thrifts with me. Whatever you do, don't tweet, instagram, text, Facebook, call or anything else my BF. He must not know how much came home! We're moving soon & well... he doesn't want me buying so much! First things first, I bought a condiment dog! 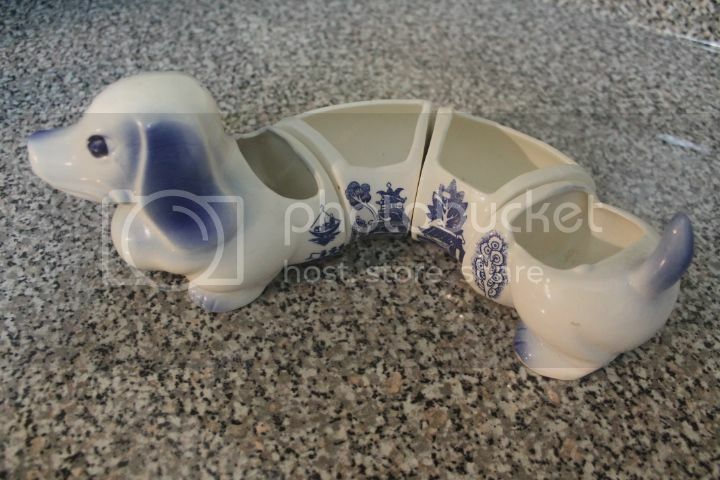 I've wanted one of these, plus a pair of salt & pepper decorations in the same style (not the same pattern, though). Blue Willow isn't totally me, but there doesn't seem to be too many condiment dogs out there. This is made in Japan. 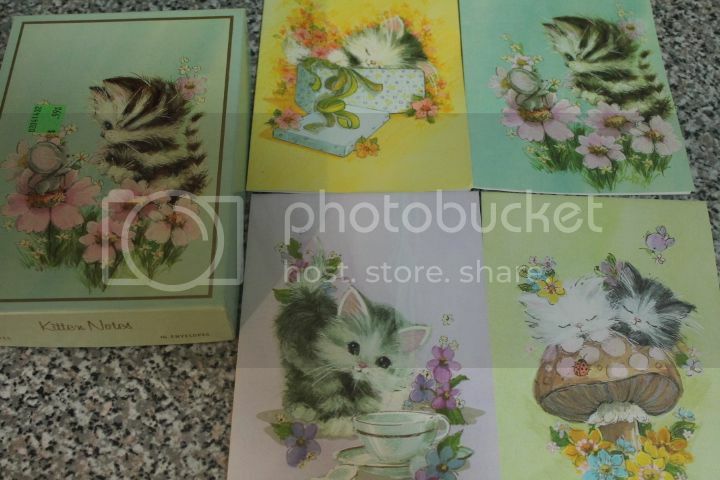 Also pictured are some vintage cards & a full set of Regal kitten notes (for sale/trade). 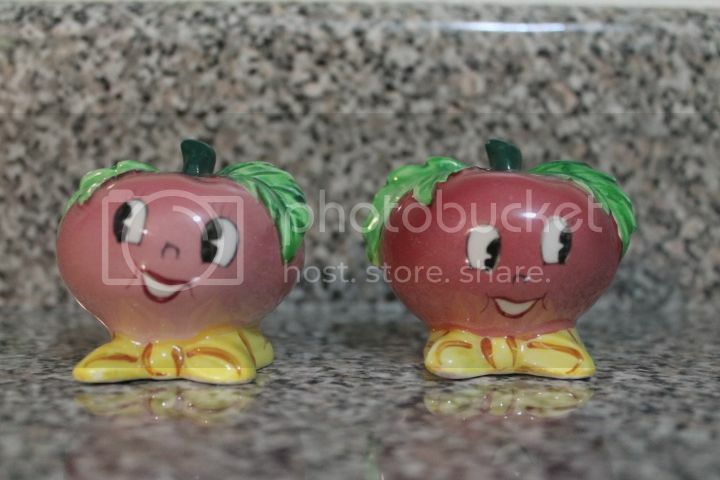 I bought these anthropomorphic salt & pepper shakers because they were a buck! I'm not really a lamp buyer. 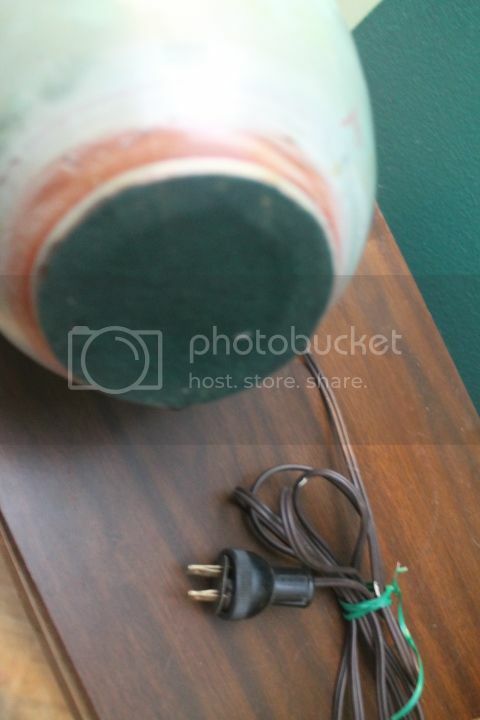 I remember getting yelled at once in a resale shop by my mother for wanting to buy a vintage lamp. "You aren't plugging an old ratty chord into my plug! It's a fire hazard!" Oh okay. That's when I was 13 years ago. That was the same store that got me obsessed with vintage cards. They sold them for a dime each. I have bought 3 lamps since. One was from the mid 1990s & one seems to be from the 70s or late 60s. Anyways, my newest lamp purchase is inspired by Van from Thrift Core. If it wasn't for her iconic lamp (view it here), I probably wouldn't have noticed this one. I know aside from the similarity in shape & that it's glazed (or something) there isn't much in common.. but yeah. I also for some reason ventured to an area of the store I never go to. Fate? This goes perfect on my small display case (full of Pyrex) next to my record player. I just need a shade. What colour would be perfect? I wouldn't know how to date a lamp. Any clue when it's from? I include a shot of bottom/plug. Annnnd.. maker? LOL. 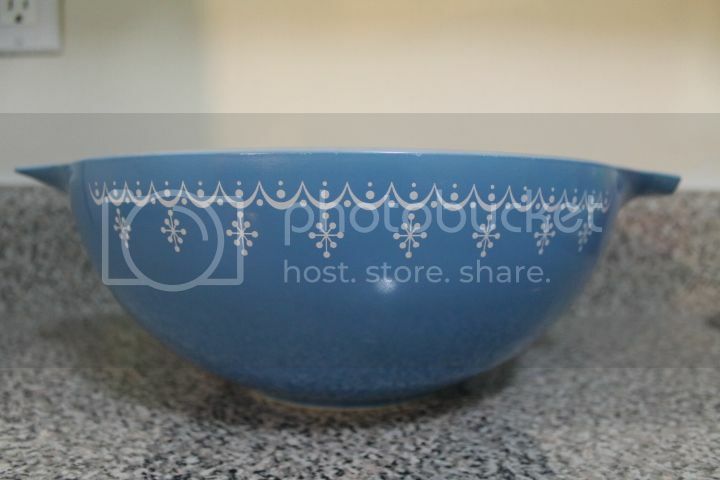 My favourite Pyrex find of the week is the loaf pan. You don't see many loaf pans around here. I have one, which I got at Savers in New York for $4. This one is in pretty damn good condition! The fridgie needed a clean up, but is in very good condition otherwise, lid had a few fleas, but whatever! Surprised it lasted a day at the thrifts. & this 474 Autumn Harvest completes my 470's Autumn Harvest set! This is a set I use all the time & for Thanksgiving. 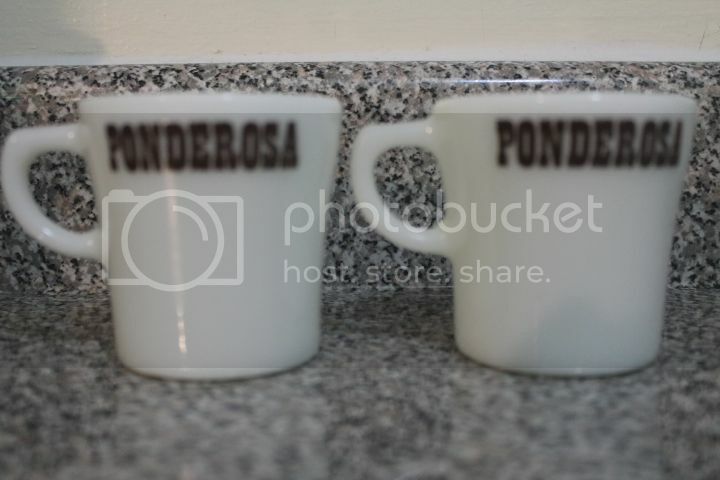 There was a lot of the Ponderosa mugs in the thrift store, but I only bought 4. 4 is a perfect set for me & I have for some reason wanted some. Well, that's it for me this week! Lots going on around here (none thrift wise). Thank you everyone for linking up last week & hope to see you again this week. Thrift on! 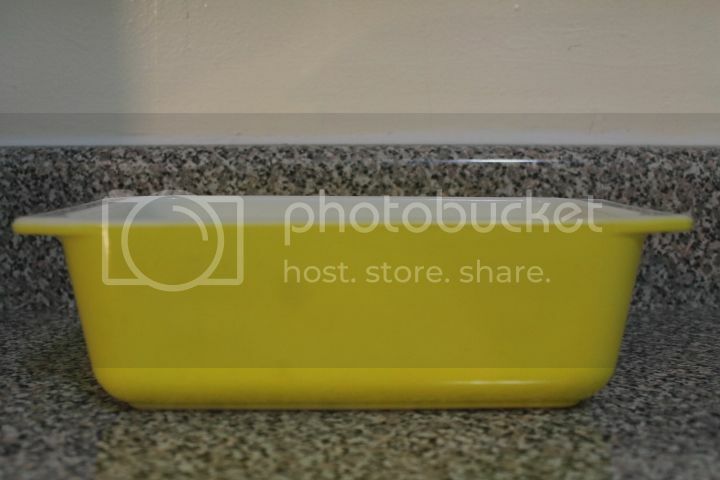 Love your yellow loaf pan! And that condiment doggie is hilarious--I've never seen one of those! I like your blog look updo. Things seems larger too. Great scores this week. Classic lamp. Good pyrex finds. Loving those salt 'n' pepper shakers. Too quirky not to have! An impressive haul, indeed. I totally sent Pyrex vibes your way! LOVE the loaf pan. I use mine all the time and everything comes out awesome in it. I'll be linking up as soon as I get all my stuff from the weekend photographed and put away. It was a good one! I lucked out with the Pyrex finds this week too! 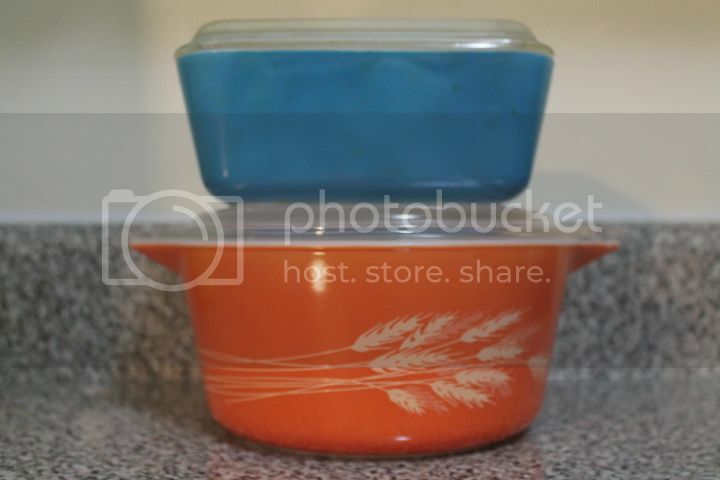 Maybe this is the time of year for people to donate their Pyrex to the thrift stores? I got a 3 piece autumn harvest set with lids, and one butterprint and two Americana casseroles with lids as well....I never get that much Pyrex in one day. Never. Maybe we had some good mojo bouncing off of us....Hope the Pyrex luck continues for you and I. I love the lamp btw! Yay! Glad to hear you had a good week!! So much super cute stuff, love the kitties and the shakers! Great Pyrex finds, I was eyeing that loaf pan on ebay but no way I could bring myself to spend $20 for it!!! Glad to see you got one at a nice price! The condiment dog is neat, never seen one before. 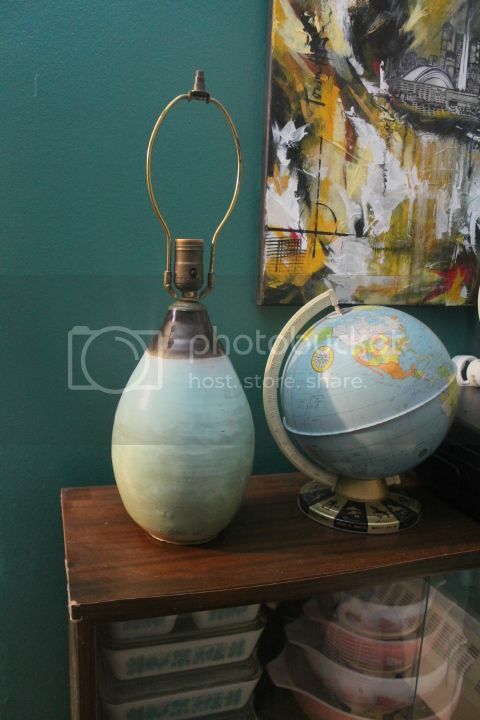 And lamps, yeah, I ended up giving a few back to thrifts because there are only so many places to put them. A couple of mine are just for show, I don't actually use them. As usual I'm jealous of your Pyrex finds. 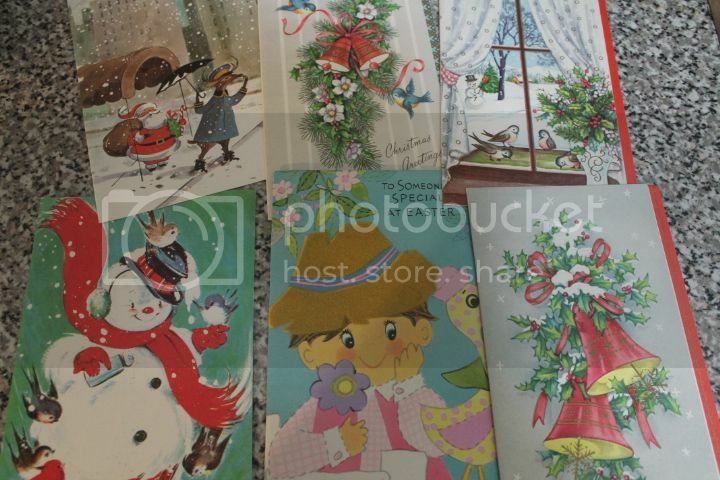 The vintage Christmas cards and lamp are also great. Great finds. I like the condiment dog. I have never seen one. Something new to look for. Thanks for hosting! Yay - so glad you had a good thrifting weekend! I did too! My faith has been restored in garage sales! My Mom had that doggie and I sold it to her from the Regal catalogue, I used to sell that when I was about 12, they had all kinds of neat stuff like that!!! Matter of fact, I just saw one at VV myself last week! Aw, that does look a lot like my lamp! Super cute. Love all the other finds too! 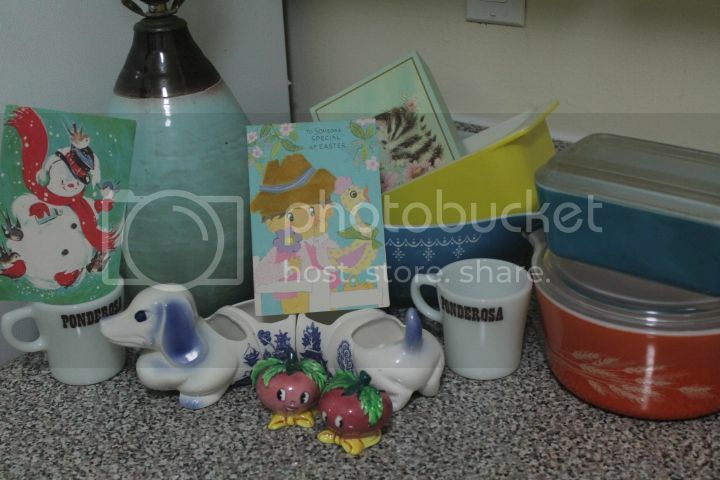 The pyrex, dog, mugs, etc. are all glorious as always. I'm made myself leave glassware behind. Pain! Wow, you really did have a good week. Congratulations! Now that I see it, I need to find a condiment dog of my own. Because weiner dog. Your secret is safe with me - I found the best stuff when I was moving last year! A condiments dog! How cute! The lamp is lovely, as for what colour shade, maybe a rustic orange?